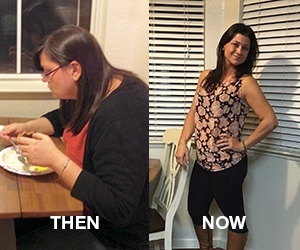 Cal Fit Success Story: Folsom Member, Jennifer R.
When I began training with Personal Trainer Michael Mascio three days a week, I weighed 241 pounds. 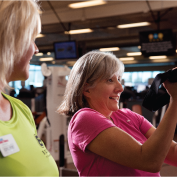 I started dropping weight immediately and felt so energetic that I asked to increase my training to five days a week. Michael considered my individual needs and tailored workouts specifically for me, increasing intensity and endurance as the months passed. He assisted me with nutrition, encouraged me to push through the difficult parts and kept me accountable to my goals throughout the entire eight months of training. Dedicated to doing what Michael recommended, I was consistently losing 2–2½ pounds a week for a total loss of 75 pounds in eight months. Many inches of fat have melted off and have been replaced with muscle. As my weight decreased my energy level increased. I started to sleep very sound and I could do anything I wanted with the kids and keep up! I’m down seven jean sizes and now I can walk into any clothing store and count on any medium top fitting nicely. It’s always a nice surprise when members come up to us while I’m training with Michael and compliment us on the awesome job we’re doing, and we both point our fingers at each other and say “it’s all her/it’s all him.” Training with Michael will stay with me for the rest of my life as I continue to apply what I’ve learned and I’ll never again let my health take a back seat to life knowing I had him in my corner.